The UCSD men’s soccer team traveled to Turlock, California last week for the California Collegiate Athletic Association Tournament and did not disappoint one bit. The team was crowned champion on Sunday after a 2–1 comeback win over Sonoma State. Prior to the finals match, the Tritons encountered Cal State San Bernardino in the semi-final, redeeming themselves with a 1–0 victory from their defeat by the same team only two short weeks ago. With the tournament victory, the Tritons keep their season alive and move on to the NCAA Tournament, where they earned a first-round bye and will host the second-round match on Sunday afternoon against the winner of Dixie State and Western Washington. 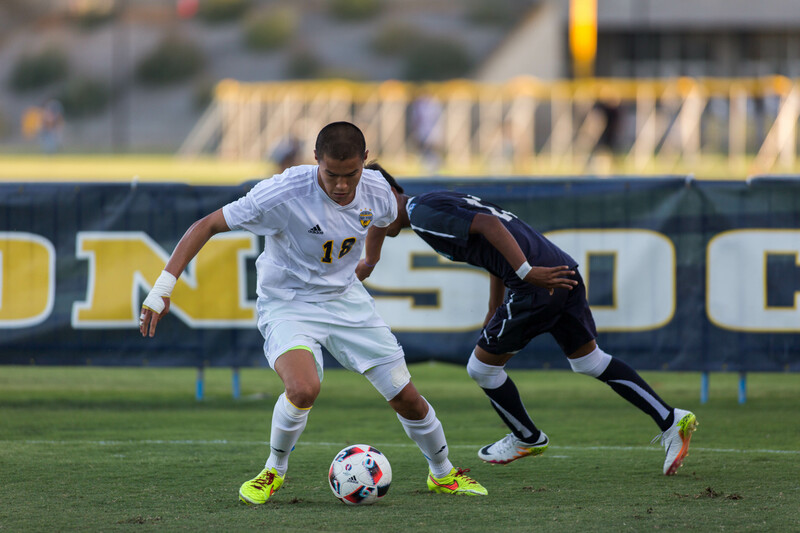 UCSD came up against a familiar foe last Friday, Cal State San Bernardino, and took care of business with a 1–0 victory. While the game was perhaps a bit tighter than the team would have wanted it to be, the result saw the team through to the final. Although only one goal was scored in the match, the intensity of a win-or-go-home scenario definitely was seen on the pitch; the dynamic between the two teams was aggressive. At times the referee gave some questionable calls, which in many ways threw the intensity and rhythm off, but the Tritons overcame it to win the game. Goal-scoring opportunities were at a premium; the few available made the difference between winning and going home. Cal State San Bernardino had an early chance to score within the first 10 minutes of play, but redshirt senior goalkeeper Cameron McElfresh positioned himself brilliantly and came up with a big save early in the match. The Tritons found success on the flanks throughout the match; however, it became difficult because of the Coyotes’ defensive strategy. They sat back and soaked up the pressure for the majority of the match, making it hard to break their defense and score. Sophomore midfielder Christian Cordell gave the Tritons exactly what they needed when he substituted in during the first half: a player who could take on defenders one-on-one. Cordell sent multiple crosses into the box within his first few minutes of play. One of the crosses found senior forward Sam Palano for the header, only to be denied by the crossbar. By the start of the second half, the Tritons had control of the match with a vast majority of the possession, and the Coyotes had trouble connecting multiple passes as they fell to the Tritons’ pressure. When playing against a team which sits back, it is vital to get the ball moving as fast and efficiently as possible, because allowing the defense to set up will make matters extremely difficult. The breakthrough for UCSD came off a San Bernardino attack. The Triton defense stopped the attack and get right into the counterattack, which left the Coyotes spread out and exposed at the back. Eventually the ball went to senior midfielder Justice Duerksen, who went one-on-one with the defender. Duerksen created space for a right-footed shot with ease, and proceeded to unleash a curling shot to the back of the net. UCSD only needed that single goal in the 54th minute to secure victory and move on to the final against Sonoma State. After going down 1–0 off a penalty shot, UCSD put in a goal in the second half and one in overtime to complete its 2–1 victory and earn the tournament championship. Again it was a physical battle against the opposing team for the Tritons, with a total of seven fouls called within the first 10 minutes of play. Although some early chances did not fall the Tritons’ way, Sonoma State did make the most of its big chance at the half. The Seawolves were awarded a penalty kick at the 34th minute mark and immediately put it past the Triton goalkeeper. At the end of the half, senior midfielder Riley Harbour nearly equalized the score for UCSD with a header from close range; however, Sonoma State’s junior defender Eric Alvarado produced a goal-line clearance to retain the 1–0 lead. A moment of brilliance came in the 66th minute for the Tritons from a long throw-in. Junior forward Uly de la Cal produced the throw-in, and a defender deflected the ball up in the air into the path of freshman midfielder Jonathan Stoop. He attempted a overhead kick, which miraculously ended up in the back of the net to level the score. Sonoma State soaked up a whole bunch of pressure from the Tritons after the equalizer and held on to the 1–1 scoreline at the end of regular time. It would be a tall order to not only keep UCSD out of the goal in extra time but score as well. UCSD, with the momentum on its side, came out firing in the first few minutes. Within the first four minutes, the Tritons produced a lethal attack after clearing the ball out of their own area. They only needed a couple passes in order to place reforward Malek Bashti in a dangerous right flank position, where he intelligently picked out Palano. Upon receiving the pass, Palano took just one touch to control the ball and the next to produce the winner with a right-footed shot. The 2–1 win means the Tritons will host an NCAA second-round match at Triton Stadium on Sunday at 12 p.m.